'The beginning of Spring' is a wide-ranging statement; for some of us it is when trees begin to emerge from dormancy and the tight Winter buds begin to colour up and swell (typically in February in the UK). All the way through to actual leaf-burst when the first leaves open on our trees. The time of leaf-burst itself can change from year to year; in the UK I had leaves open on my bonsai in mid-March in 2017, whereas the year before in 2016, it was mid-May before my trees were in leaf. As yet, there is no way of accurately knowing when this phenomenon will occur each year. However, we are beginning to understand why the beginning of Spring can vary, and develop an educated guess as to when it will start. It is light levels, the amount and intensity of light, that dictate when trees enter dormancy in Autumn, and also when they emerge from dormancy in Spring, and not temperatures. In fact typically, the colder a winter, the earlier a tree will emerge from dormancy! A Winter bud starting to swell and colour up on a Hawthorn bonsai (Crataegus monogyna), turning into a Spring bud in late January. Is growth in Spring prompted by warmer average temperatures? Until recently I thought that the arrival of Spring, at least in woody plants and trees used for bonsai, was a result of average temperatures reaching a certain warmth, bringing about the beginning of the growing season. However, during the late Winter of 2017 I realised that light-levels had a much more significant influence on the arrival of Spring, even in deciduous trees that are leafless through dormancy. I had many hawthorn overwintering unprotected, outside in my garden, but I also had a huge number of hawthorn tucked up in the protection of a shaded polytunnel. Throughout the January I had heated the shaded polytunnel to an average 8-9C in an effort to start them into growth early and extend their growing season (and therefore development). During the first two weeks of February that year, we had hard frosts each and every night with subzero temperatures each morning. But the days were very bright and sunny. 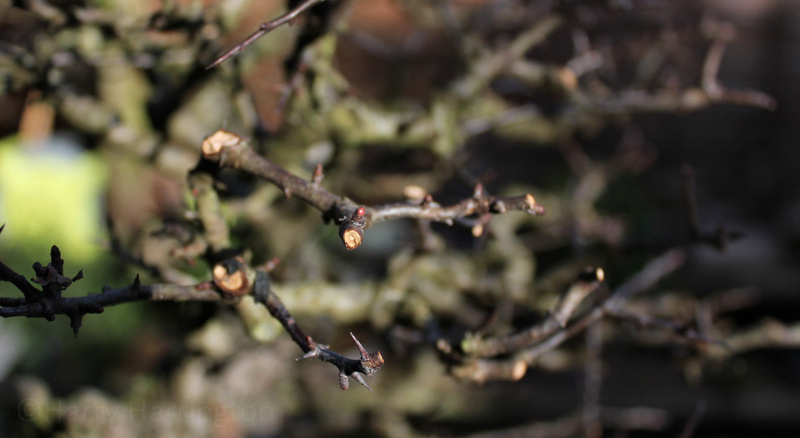 Despite the cold, I noticed that the Hawthorns outside in the garden began to colour up their dormant winter buds. This was a sure sign that the trees were actively coming out of dormancy, even though temperatures were quite definitely cold! However, in my warm but shaded polytunnel, where there had been no frosts and very mild temperatures, none of the trees showed any sign of activity. And this lack of activity in the polytunnel continued for another 3-4 weeks. Despite the warmth provided to the trees, they were by that time, a month behind those trees left outside in colder but lighter conditions. The effect of light levels on trees breaking dormancy. So how do increased light levels have an effect on dormant trees that have no leaves? According to many scientific reports, the winter/spring dormant buds of deciduous and broadleaf trees are photosensitive and increased light levels on their dormant buds is the trigger that wakes them up. Temperature is still a factor as to when trees emerge from dormancy, but not as we expect. Dormancy is broken when a deciduous tree has had enough cold weather.....if we have a harsh winter, the amount of “cold time” required by a tree is actually reached earlier in the seaon and therefore spring is earlier. So after a mild winter, spring is delayed because it takes longer for the trees to have experienced enough days of cold. This theory is borne-out by the arrival of Spring in the UK in 2016 and 2017. Leaf-burst in 2017 was very early despite the cold bright February that we experienced, whereas in 2016 after a record-breaking mild and rainy winter, leaves on our trees didn't open until a full 2 months later.